On September 25, I was surprised and very honored to receive the first Lifetime Achievement Award from The State Bar of California's Law Practice Management & Technology Section. It was a bit overwhelming to have this new award named after me, and given to me as the first honoree, particularly because it comes from my professional peers. I formerly served as chair of the Section and currently serve it as an advisor. But other distinguished colleagues have served in similar roles, so I don't claim any uniqueness there. Upon reflection, I believe it speaks highly to the professionalism of the Section that it chose to recognize someone who has taken public stands contrary to some positions advocated by the State Bar. Over the years I have been on the contrary side of the Bar's efforts to implement mandatory CLE standards, to restrict lawyers' ability to sell their practices, to require mandatory reporting of whether a lawyer has malpractice insurance, and to require law practices to develop mandatory succession plans, to name a few issues. My motivation has not been simply to be contrary; in every instance I have spoken out against policies that I felt harmed the sole and small firm practitioners who make up anywhere from 65% to 80% of the Bar's membership. In a debate about the malpractice insurance issue these lawyers were referred to by a participant as "Ed's People." However inaccurate that term may have been, I was certainly flattered by its use. Yet I hasten to add that I care deeply about the Bar and have long been involved in its work. I am, for example, gratified that The State Bar of California has for years approved Edward Poll & Associates, Inc. as a provider of education for lawyers. We have presented and provided programs on "The Business of Law"® and its role in improving lawyer-client relations. Thousands of lawyers have benefited from our efforts over the years, and I greatly appreciate that the provider status granted by The State Bar of California recognizes this contribution. Back in the Vietnam War controversies of the 1960s, many people condemned dissent by using the phrase "Love It or Leave It." I reject that idea, whether for a country or a professional association, and will continue to do my best to work within the State Bar for the benefit of all lawyers. 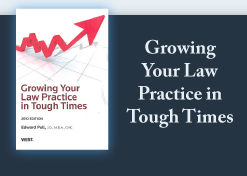 My goal is simple: to help the Bar help its members learn how to be more effective with their clients, more efficient in delivering their legal services and more profitable, especially in these tough, troubled times. And, when lawyers are profitable, there is little motivation to invade clients' trust accounts, a public service. That is certainly a worthy lifetime work, and I am grateful to the Bar for their acknowledgement of my efforts over the years. This is the week that all the craziness starts! This is when stores have deep, deep sales discounts. This is when we start worrying about who to invite to parties, to dinners, who to send holiday cards to and how we can stay peaceful in households abuzz with anxiety. My wife surprised me this morning with a smile and laughter. This time of year typically is more stressful for her (and therefore for me ☺) because she (as do many women) bears the burden of determining who gets what in our family. I have the easy part of cooking our family turkey. Thanksgiving is MY holiday, the one time of year when I want all our kids and grandchildren to be here, at the same time and place. Other holidays are nice, but this holiday for me is particularly special. The real challenge, I think more so this year than before, is to seek some equanimity, harmony and real goodwill. My hope for you is peace and joy with your families... and a safe and happy journey through the balance of this year.